Holland Park appears to be missing. Someone on Reddit spotted this as well. Whoops! I'll correct the version on here - hopefully not too many people notice on the Evening Standard version. Could the Crossrail 2 route between Victoria and Tottenham Court Road be straightened to avoid the double bend? The double bend definitely is ugly. I remember trying lots of configurations, but I think this was the only one where I could fit all the text labels in. 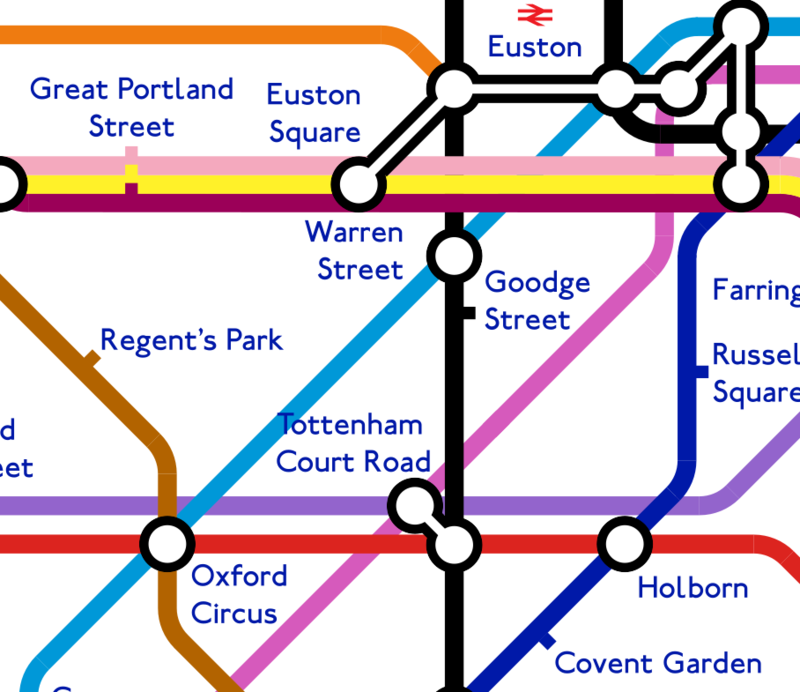 When I did the original Crossrail 2 tube map I had a small enough font that I could squeeze Crossrail 2 between Oxford Circus and Leicester Square - but I think this time the gap is just too narrow. But if you do have a specific idea that might work, I'd definitely be happy to give it a go! How about turning CR2 to 045 degrees just north of Vic and run it right the way through TCR? You could make room by moving the Central / Elizabeth line interchange circle to west of the station rather than east. The issue I have is where to squeeze in the Tottenham Court Road label without it crossing over any lines. There could definitely be a way, though. Yea, as current positioned, the TCR label looks more associated with Holborn than the actual TCR. If you moved the Warren Street label west of that station, and moved Goodge Street north with its label east of the station, would that give you room? 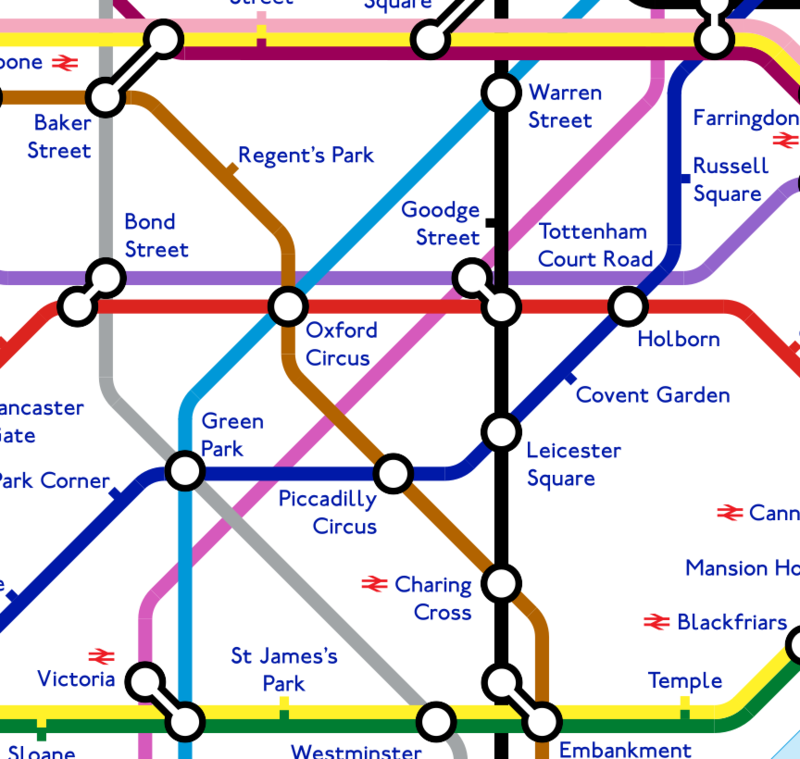 Maybe you get a little more space by moving Oxford Circus station slightly west, adjusting the position of the Vic and Bakerloo lines accordingly. If, as reported elsewhere, renaming a whole line only costs £5000, it might be the easiest solution. Tottenham Court Road is ambiguous as a name anyway - Goodge Street and Warren St stations are also on that thoroughfare, and between them are closer to 75% of it. How about St Giles or Centre Point? As the future interchange between Crossrails 1 and 2 what could be more appropriate? I’ve always liked the idea of the Centrepoint name. However, the Tottenham Court Road station name is so linked with that location now, I can’t see it ever changing. And if you start changing one ambiguous name, where do you stop? Would Embankment, Baker Street, Finchley Road, Old Street, Edgware Road etc need to change too? Move the Warren Street name so that it is west of the Northern line. Move the Goodge Street station tick a bit north, and insert the name to the east of the line. Squeeze in the Tottenham Court Road name into the space formerly occupied by the Goodge Street name. EDIT: Just realised that I’ve pretty much said the same thing as Chris M! One of the tricky consequences of moving the Warren Street label left of the station is having it be a little too close to Euston Square - perhaps Euston Square could be moved back directly below Euston, but it would be hard to fit a label there. 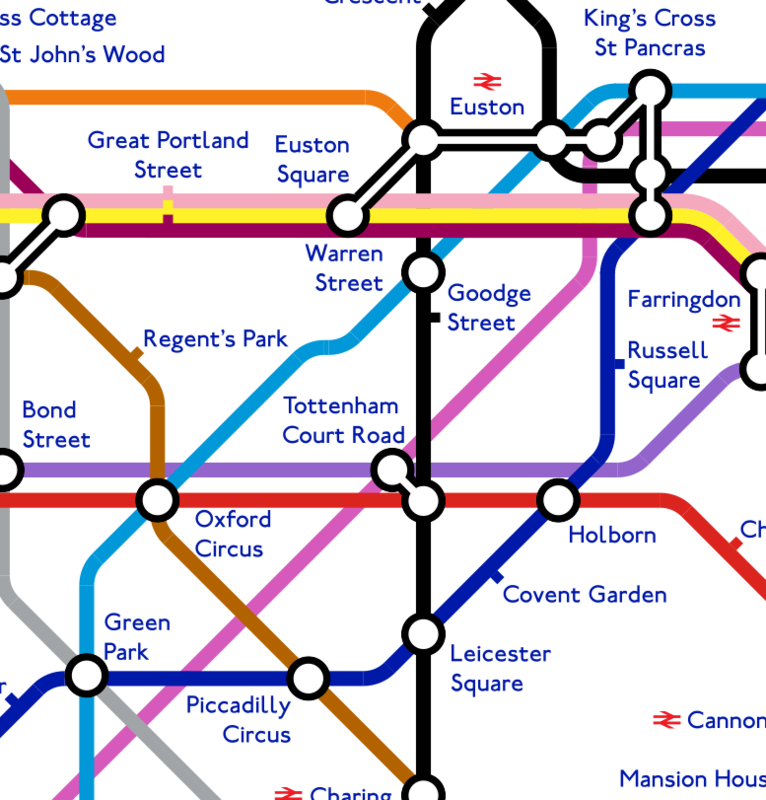 One of the nice aspects of the original map was that the Victoria line was a clean diagonal all the way through Oxford Circus, Warren Street and Euston - this isn't easy to have when Oxford Circus is moved to the left, since Warren Street can't go any further north without colliding with the Circle line. 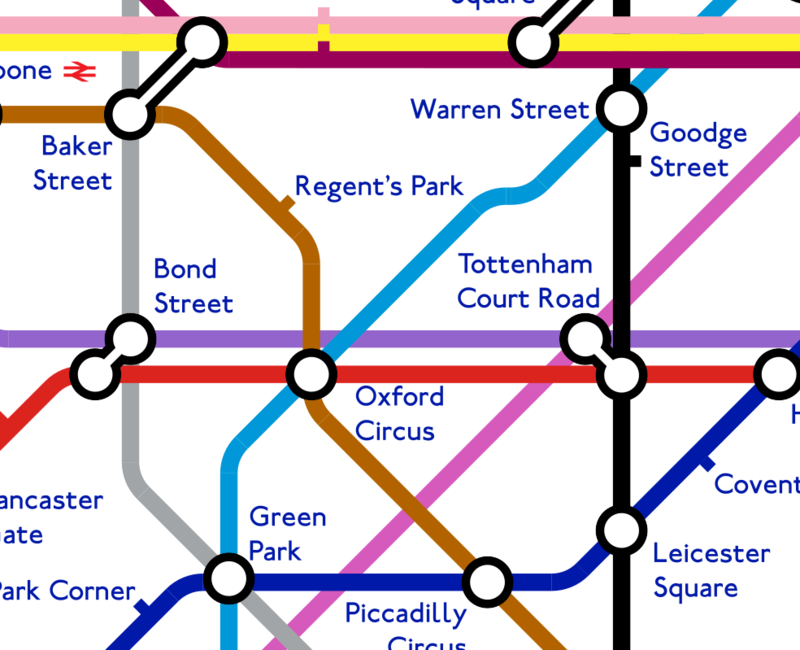 Try making 'Warren Street' a single line of text, although you're still stuck with the 'Tottenham Court Road' problem which is the point at which I lost my temper with it. I'm not keen on the kinked Victoria Line arrangement though. Good point! A single-line Warren Street looks a lot better. I agree with you, having a kink in the Victoria Line isn't all that nice.